Investing in a supplement like Bone + Oak Forskolin these days can not only be a risk to your finances but to your health as well. Today it is very easy to be scammed online considering that supplements are not regulated, tested, or approved by the FDA so they simply do as they wish and sell you anything they like without having to disclose full information first. With that said, I had to dig deeper on Bone + Oak Forskolin as it was the first that I’ve heard of it and was just in search of something to help me drop the pounds. As a blogger I sit all day at the computer and get very little exercise, food is my enemy and it shows. Here are my conclusions. Well, from the official website we learn that it is a great supplement that helps you burn fat faster by helping you block it and suppressing your appetite. It also helps with boosting energy and serotonin levels which prevent emotional eaters from turning to food. It also states that the supplement has got the media and scientists buzzing which led me to believe I will find plenty of information online about the supplement. Boy was I wrong. I actually found no media coverage or scientific papers which leads me to believe that this may just be a marketing line as they are not held to what they write on these sites. In addition to getting media and scientists buzzing the supplement is 100% natural and offers numerous benefits. This is because it is jam-packed with 46 kinds of antioxidants, 90 nutrients, and the vitamins B1, B2, and B3 which makes it considered the most nutritious in the world. 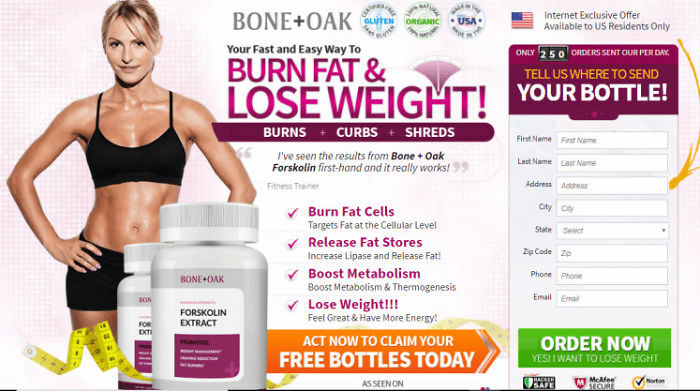 As per the official Bone + Oak Forskolin website. I fell for it all except for being considered the most nutritious, at least not without further proof. What are the Ingredients in Bone + Oak Forskolin? Are they Safe? In all honesty, I do not trust anything that is not an image of the Supplement Facts on the back of the bottle as they can basically write anything they like and omit any information they please. Including side effects, fillers, or additional ingredients that could be dangerous. With that said, I was provided with a list of ingredients in paragraph and image form with a brief description of their benefits. Here they are with a bit that I added myself. The descriptions are basically what the official Bone + Oak Forskolin website provided, I just added a bit to it. Moringa: New discovery that helps stimulate the metabolism so you lose weight faster and help you burn more calories. It is jam-packed with nutrients all beneficial for weight loss. DID YOU KNOW: Since it’s relatively new there is very limited testing done on this ingredient especially in medical amounts. Also, the plant and fruit are edible but the root and extracts could be very dangerous as they may be linked to paralysis and even death as they may have a toxic substance. White Kidney Beans Extract: The calories from these are not absorbed while they help prevent the stomach from breaking carbs down into simple sugars. DID YOU KNOW: Though very safe and risk-free they can cause stomach upset, bloating, constipation or diarrhea. Green Tea: Already well known for its numerous benefits it is easily one of the healthiest beverages on the planet with numerous antioxidants and health benefits which in turn help you lose weight. DID YOU KNOW: Regardless whether you drink Green Tea on a daily basis consuming it in a supplement may cause a number of side effects including Confusion, convulsions, ringing in ears, dizziness, heartburn, irregular heartbeat, tremor, irritability, diarrhea, vomiting, sleep problems, and nervousness. Raspberry Ketone: Known as the “new fat burning berry” their amazing fat burning capabilities have impressed many. DID YOU KNOW: Regardless how much they market it this ingredient still has not been tested enough to ensure safety. It may cause a pounding heart, increased blood pressure, rapid heartbeat, and jitters. Forskolin: Numerous weight loss and health benefits it helps increase hormone sensitive lipase which is an enzyme which helps burn fat. DID YOU KNOW: Like several other ingredients in this list, it has not been thoroughly tested for effectiveness and safety. May cause low blood pressure and flushing. Garcinia Cambogia: Already quite popular with its benefits through the numerous marketing sites trying to sell it the ingredient helps suppress appetite, tap into fat stores, and help you lose weight. Containing a high % of HCA it helps speed up the weight loss process. DID YOU KNOW: In 2009 the FDA actually recommended anyone taking Garcinia Cambogia to stop as there was a possibility of it being linked to serious liver problems. With that said it may cause the following side effects: diarrhea, upset stomach, headache, dry mouth, and dizziness. Green Coffee: Very effective aid to lose weight and considered safe. Recommended by Dr. Oz it does not leave you with jitters as with caffeine. DID YOU KNOW: Though it may not cause jitters it may cause insomnia, restlessness, increased breathing, increased heart rate, vomiting, nausea, upset stomach, and nervousness. Caralluma: Helps enhance your energy all the while suppressing your appetite. DID YOU KNOW: This is probably the safest of the listed ingredients with temporary possible side effects such as stomach pain, constipation, intestinal gas, and stomach upset. How does that sound? Maybe natural but honestly I wouldn’t want to experience some of these. How much does Bone + Oak Forskolin Cost? Please note that you are also automatically signed up for the My Healthy Helper for 30 days and if you do not cancel before 30 days are up you’ll be charged $9.74 monthly. Also, in the Terms & Conditions, I was unable to find any information about the risk-free money back guarantee which is flashing everywhere on the website. I read about returns within 30 days of receiving the bottle/s but they had to be returned unopened to get your money back which kind of kills the point. So is Bone + Oak Forskolin a SCAM? I think so. Perhaps I would be more willing to purchase Bone + Oak Forskolin if they offered full ingredient list, had more information on the return policy or perhaps a 14-day trial, and well, didn’t have ingredients with such bad side effects. Previous Article harga penirum asli di apotik : Seberapa Aman dan Efektifkah Produk Ini?